The name Salvia (“salviya”) derives from the Latin salvere (“to feel well and healthy, health, heal”), the verb related to salus (health, well-being, prosperity or salvation); referring to the herb’s healing properties. Sage was a sacred ceremonial herb of the Romans and was associated with immortality, and was also said to increase mental capacity. The Greek Theophrastus classified sage as a “coronary herbe”, because it flushed disease from the body, easing any undue strain on the heart. In the middle ages, people drank sage tea to treat colds, fevers, liver trouble, epilepsy, memory loss and many other common ailments. 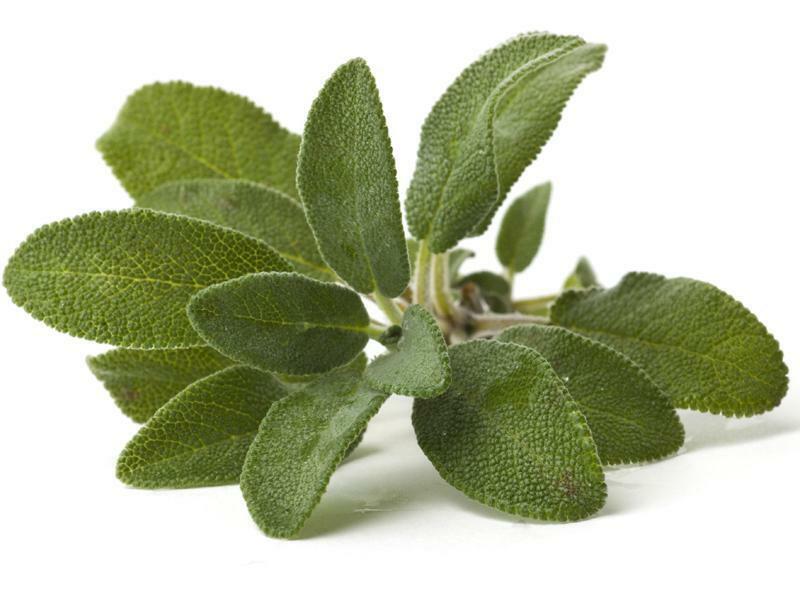 Sage was held to be a major medical herb by the French, because of it’s anti-bacterial properties. The early colonists considered sage almost as essential a spice as salt and pepper, and its use in the culinary arts of Thanksgiving have become an American tradition. Sage tea was a valuable remedy for colds, fevers in the harsh New England winters. There is an old Arab belief that if your sage grows well you will live a long time. During the fourteenth century, three leaves a day were to be eaten to avoid the ‘evil aire’. Sage was also a favorite of the Hungarian gypsies, they believed that it attracted good and dispelled evil. Chia, Salvia hispanica was referred to as “Indian Running Food” by the Apache and Aztec warriors who sustained themselves while on conquests and hunting. The uses of sage outside of the kitchen range from the mundane to the mystical, from a cure for the common cold to the psychoactive effects of Salvia divinorum and Salvia apiana in ceremonial and religious celebrations. It’s Analgesic, Antibacterial, AntiCancer, Antifungal, Antioxidant, Aromatic, Astringent, Depurative, Emmenagogue, Nervine, Anti-inflammatory, Anti-allergic, Antiviral and Antiseptic. Contains very good amounts of vitamin-A and beta-carotene levels. 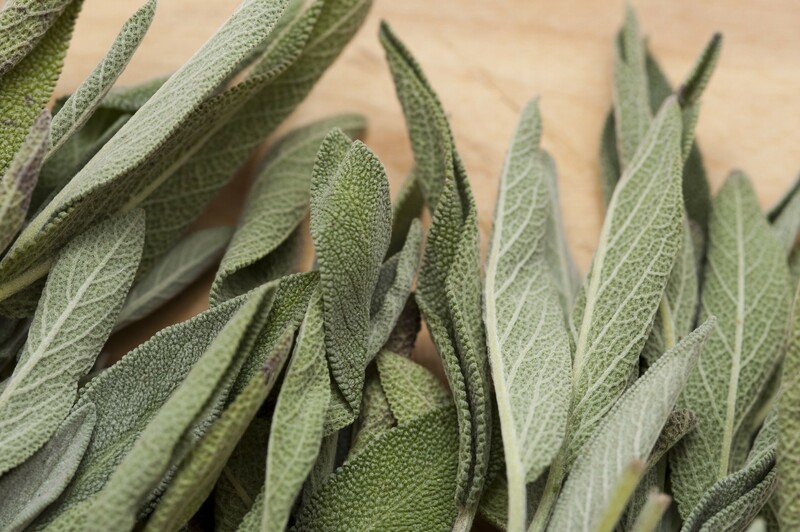 Fresh sage leaves are a good source of antioxidant vitamin, vitamin-C. Constituents: volatile oils (including thujone, cineole, borneol, linalool, camphor, pinene), oestrogenic substances, salvin and carnosic acid, flavonoids, phenolic acids, rosmarinic acid, tannin. Rich source of several B-complex groups of vitamins such as folic acid, thiamin, pyridoxine and riboflavin many times higher than the recommended daily level. Sage has been used for centuries as restoratives of lost or declining mental functions such as in Alzheimer’s disease as it’s beneficial for memory disorders. Increased intake of sage as a seasoning in food is recommended for persons with inflammatory conditions (like rheumatoid arthritis). Helpful for relieving the hot flashes of menopause, and slowing heavy menstrual bleeding. age is an excellent natural disinfectant and deodorizer, drying perspiration and helping to eliminate body odor. Extracts of sage are used in personal skin care for its capacity to heal the skin as well. Also taken for bronchial asthma, cold sores, throat infections, gingivitis, sore gums, typhoid, gastrointestinal issues, digestion and used for cellulite, dental care, deodorants, darken graying hair, insect and lice repellent. Parts Used: Leaves, small stems and flowers. Preparation Methods: Sage can be used fresh or dried both as a culinary herb and medicinal herb. Sage can be taken as a tea, and the infusion can used externally as a skin and hair rinse, and as a gargle for sore throats. Liquid extracts can be diluted with water and easily applied to teeth and gums. The essential oil is used sparely, and is never ingested. White sage is burned as incense in Native American ceremonies. Side Effects: Adverse reactions are likely only with overdoses (more than 15 g sage leaf per dose) or prolonged use. Salvia apiana is the white sage sacred to a number of U.S. Native American Peoples, and used by some tribes in their ceremonies. 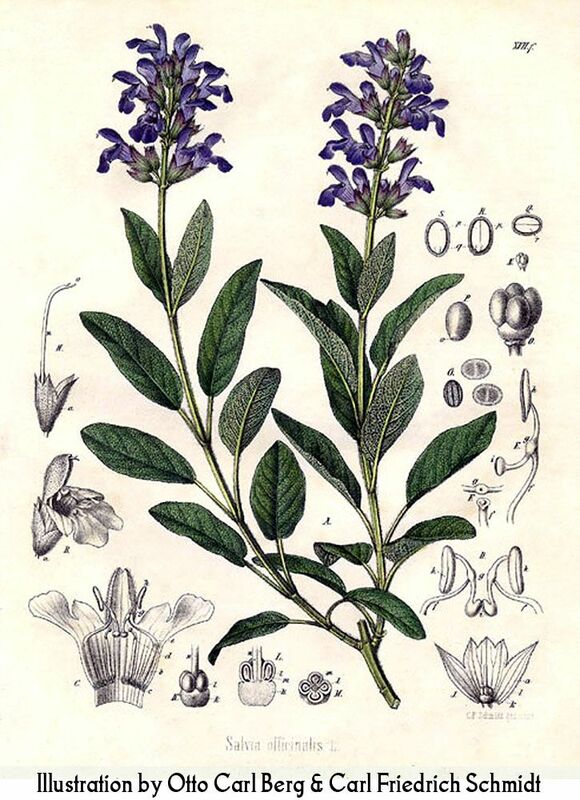 Salvia cacaliifolia is the blue wine sage or Guatemalan sage blooming with many pure gentian-blue flowers. Salvia divinorum, or diviner’s sage, is sometimes cultivated for psychedelic drug effects; the legality of its use is under review in some US states. Salvia elegans, the pineapple sage, is widely grown as an ornamental shrub or sub-shrub, with pineapple scented leaves. Salvia fruticosa, called Greek sage or just sage is commonly grown and harvested as an alternative to common sage. Salvia hispanica, commonly known as chia, produces edible seeds which are high in protein and in the omega-3 fatty acid, α-linolenic acid (ALA). Salvia leucantha, Mexican bush sage or woolly sage, is grown as an ornamental in warm climates for its drooping flower heads, with white flowers emerging from furry blue or purple bracts. Salvia microphylla from Mexico, sometimes called baby sage, is a small shrub grown extensively for its red (sometimes pink or white) flowers, and its fruit scented leaves. Salvia miltiorrhiza, Chinese, Red sage, Danshen medicinal herb. Salvia officinalis, or common sage is used widely in cooking, as an ornamental and landscape plant, and in herbal medicine. Salvia sclarea, clary or clary sage, is grown as an ornamental and to some extent for perfume oils. 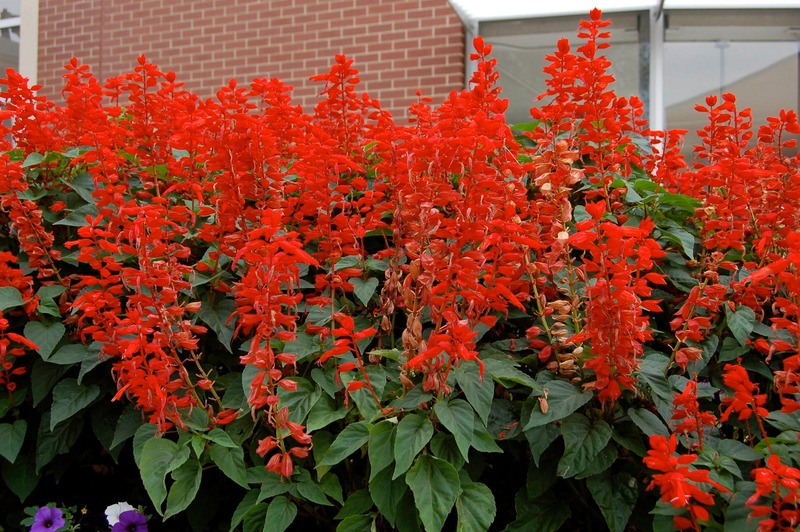 Salvia splendens or scarlet sage is a popular ornamental bedding or pot plant. Salvia guaranitica or hummingbird sage is grown as an ornamental flower. Salvia can be grown indoors in a sunny window. Both Roman and Greek civilizations used sage as a preservative for meat, a tradition that continued until the beginning of refrigeration. What these cultures knew from experience, that this herb could help to reduce spoilage, is now being confirmed by science. Researchers have isolated the sage’s numerous terpene antioxidants, which protect oils from oxidation and prevent rancidity. Mix together and spread out on a cookie sheet with a lip edge and bake on 200 * for 25-35 minutes until nice and dry. You can place Sage Salt in a food processor until fine for use in a salt shaker or leave coarse. Add fruit to water. Rub sage between hands to bruise the herb and release the oils, add to water. Let sit at room temperature for 1-2 hours or in the fridge for 3-4 hours. The longer you infuse the water, the stronger the flavor. Discard fruit and herbs after 48 hours to prevent from spoiling. Store vitamin water in fridge up to three days. Pour water over sage leaves and let steep for 10 minutes, strain and add honey and lemon if desired. Drink or gargle tea. A strong cup of Sage Tea can help relieve a nervous headache. 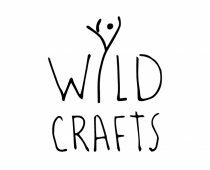 Strain and pour tincture in a dark glass jar, preferably with a dropper, and store in a dark place.You can gargle with sage tincture or take 5-10 drops twice daily at the first sign of a cold or use to treat sore throats. The phenolic acids in sage are particularly potent against Staphylococcus. *Note: Mothers who are nursing should avoid consuming sage because it can decrease milk flowFor treating Alzheimer’s disease, 1 gram of sage per day is recommended. After your smudge stick is dry, it is ready for use and help purify the air and kill airborne bacteria.